The Cotswolds is home to dozens of luxury, boutique and family-friendly hotels. There is no shortage of choice for visitors to the region, so to help you decide, here is our “Top 10 Hotels in the Cotswolds”. Perhaps the best boutique hotel in the Cotswolds, Foxhill Manor is a private manor house with eight bedrooms and suites. This beautiful building is Grade-II listed and decorated in the Arts & Crafts style. Set on private grounds within a 400-acre woodland estate, Foxhill Manor is a very relaxing location for a holiday or short getaway. Staying at Foxhill Manor feels like being invited into someone’s private mansion. The interior is glamorous and character-filled. Facilities are also very modern thanks to a £2.2m renovation in 2014. Rooms are designed thematically and include “Willow”, “Maple”, “Juniper and “Birch”. Suites include “Beech”, “Hazel” and “Oak”. There are many activities to enjoy on the estate including the house spa, shooting, tennis and hiking. It is well-situated within the Cotswolds so visiting tourist attractions in nearby towns is very easy. If you are a foodie, the Le Manoir aux Quat’Saisons Hotel in Oxfordshire is the perfect location for a getaway. The hotel features a Michelin-starred restaurant and has a cooking school so you can learn some of the techniques of the professionals. Private tuition is also available. The hotel’s rooms come in a variety of themes and all are luxurious and finely appointed. Visitors can choose from a wide variety of rooms and suites including the “Blanc de Blanc”, an elegant suite filled with dozens of shades of white. The hotel is surrounded by beautiful decorative and working gardens that produce most of the organic produce used by the kitchen. A getaway that your taste buds won’t forget for a while! Another beautiful country house, Cowley manor has an Italian-styled exterior with very contemporary and modern interiors. Located in Gloucestershire (a short drive from Cheltenham), the manor offers 30 rooms in a variety of styles. Cowley manor also features a state of the art spa with an indoor swimming pool, outdoor swimming pool, hot tubs, steam room, gym and sauna. For guests looking at relaxing during their holiday, Cowley Manor’s spa is a major selling point. One of the most highly rated country houses in the Cotswolds, Buckland Manor has an excellent reputation for quality service. This 13th-Century country house is huge and luxurious, offering 13 rooms and suites. The rooms are elegant and refined, featuring plush soft furnishings. Set amidst 10 acres of perfectly manicured English gardens, it is a fantastic location for visitors who want to enjoy a peaceful retreat with their family or spouse. The hotel has a restaurant offering a highly rated fine-dining experience, tennis courts and croquet lawn. Ellenborough Park is a large family-friendly and pet-friendly manor house featuring 62 rooms. There are plenty of activities for the kids on the grounds including a swimming pool. Located in Cheltenham, this 5-star hotel has a very good reputation for friendly staff and quality service. The hotel has a spa and fitness centre along with a brasserie on site. The brasserie focusses on French and European cuisine with plenty of options for the kids. Another country house that offers a luxurious spa, beautiful gardens and elegant rooms is Whatley Manor Hotel. 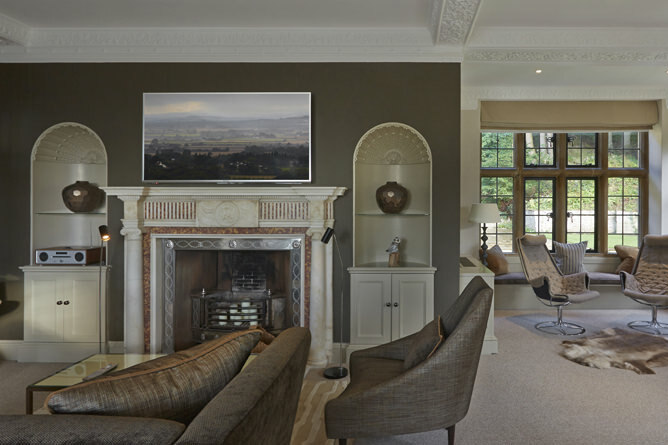 This Cotswolds country house offers 15 rooms and 8 suites, set within 12 acres of gardens. There is a two-starred Michelin restaurant, a brasserie, fitness centre, bar and spa on the grounds. Whatley Manor is one of the few luxurious manor houses that is pet friendly. The hotel is rated 5 stars and is fantastic choice for couples looking to enjoy a romantic weekend. Another great getaway for families, this hotel is perfectly located in the Cotswold water park. There are dozens of activities for the kids in the water park including sailing, swimming, fishing, rowing and much more. The hotel has a fitness centre, restaurant, pool, bar, hot tub and modern spa. The spa gives parents an opportunity to relax while the children are enjoying the outdoors. The hotel is very large and has 328 rooms on offer. The design is modern contemporary with rooms that are light and airy. This hotel is well-located and within close driving distance of many family friendly attractions. This 4-star hotel has 197 rooms and all of the modern amenities one would expect including: a swimming pool, fitness centre, wifi, spa, golf course, restaurant and bar. Set within 440 acres of Oxfordshire countryside, this is the perfect “home base” for a family making the most of nearby tourist attractions. If you are a fan of charming and rustic hotels that offer great pub food, the Old Swan and Minster Mill Hotel is a fantastic place to stay. Built within carefully restored 18th-Century buildings, the hotel is very charming and warm. There are 65 acres for the children to run around on and activities including table tennis, table football, horse-riding and fishing. There is also a child minding service so parents can enjoy a romantic night together. If you are looking for a romantic getaway, the Lamb Inn offers an exceptional experience. This 14th-Century inn is absolutely beautiful and charming. With some rooms recently refurbished, this inn offers modern amenities within a character-filled building. The award-winning restaurant is very intimate and perfect for a romantic getaway.